Looking for an addition to your Florida landscape? Consider the fern—that tropical plant that comes in all shapes, sizes, and textures; is easy to care for; and lends an island feel to your beds and porches. There are hundreds of fern species to choose from, so first decide which spaces in your garden or landscaping need foliage. This will guide your fern selection. Do you need groundcover? Could your yard use a specimen plant? Does your bed need shrub-sized plantings? How about your porch? The versatile fern can grow in a container as well as it can grow in the ground. Here are our suggestions for the perfect ferns for your spaces. Wart ferns, so called because the spores on the backs of their leaves cause bumps on the fronts of their leaves, only grow to about one foot tall. They spread, but not in an out-of-control manner, and they cover landscape beds well. A Florida native plant, the Giant Sword fern (also called the Macho fern) grows about 3 feet tall and almost as wide. The Sword fern or Boston fern grows about two feet tall. This fern spreads. The Fishtail fern, with a unique ruffly growth habit, reaches about three feet tall. It does not spread quickly. Holly ferns do not spread and grow to about two feet tall. They have large, glossy leaves. Tree ferns—those that grow over ten feet tall—make good specimen plants and perform well in the back “row” of a layered bed, i.e. a bed whose plantings get progressively shorter from back to front. The Giant Leather fern grows 6-12 feet tall and almost equally as wide, so this one needs abundant space whether it’s placed as a single specimen or in a back-row lineup. It grows well in zones 9a-11b and is highly salt tolerant. The Australian tree fern grows 15-30 feet tall and has a spread of 8-15 feet. This one, like most ferns, needs water and light shade to prosper. It does best in zone 10-11 but can be grown above those zones in containers that are brought inside or covered in the cold. Foxtail (or Asparagus densiflorus ‘Myers’) ferns, Boston ferns, and Maidenhairs do well in containers as long as they are kept watered. When put into a hanging planter and suspended from a ceiling hook or a shepherd’s hook, they add a beautiful focal point to a porch or bed. 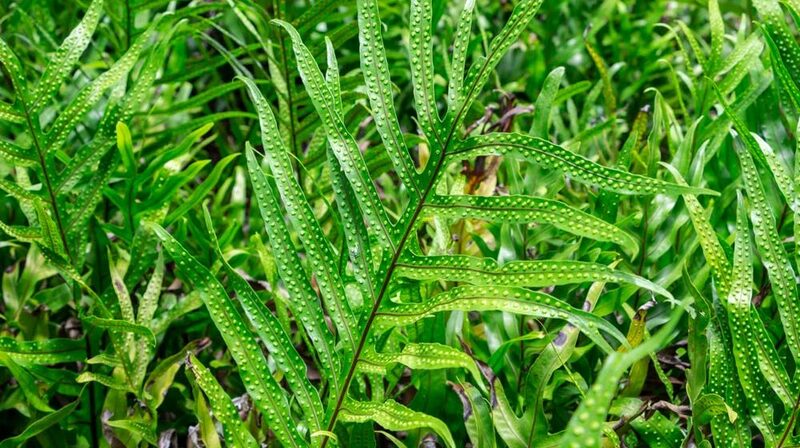 Stay away from the invasive variety of the Sword fern. It will take over a bed and grow through and around all other plants. The noninvasive Sword fern looks the same as the invasive Sword fern, so be careful to select the correct one. All ferns need regular watering. They benefit from fertilizer in the spring and late summer. In south Florida, ferns thrive outdoors year-round. In central and north Florida, they should be brought inside or covered when it gets cold. A freeze can kill them, especially if the freeze is prolonged.